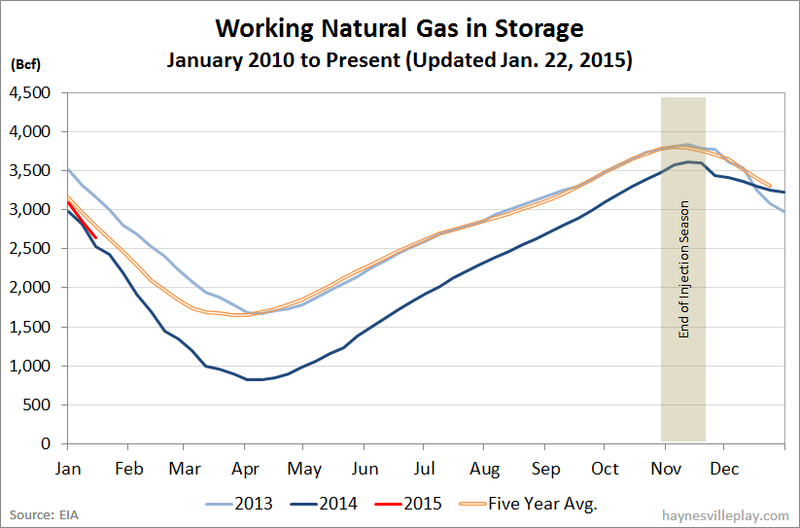 The EIA announced this morning that working gas in storage was down 216 Bcf to 2.637 Tcf. The weekly withdrawal was 62% larger than last year (-133 Bcf) and 23% above the five year average (-176 Bcf). The current storage level is now 8.2% above last year (2.438 Tcf, a difference of 199 Bcf) but 5.5% below the five year average (2.79 Tcf, a difference of 153 Bcf). Temperatures in the Lower 48 last week averaged 29.3 degrees, which was 10.9 degrees cooler than last year and 3.7 degrees cooler than average. "Demand tumbles to 2015 low. With milder weather, U.S. natural gas consumption fell 21%, hitting a 2015 low of 80 Bcf/d on Sunday, January 18, with consumption across all sectors decreasing, according to data from Bentek Energy. Led by a 29% week-over-week decrease in the residential/commercial sector, U.S. consumption for the report week was also 6% lower than year-ago levels. Natural gas burned in the electric sector (power burn) fell 17% for the report week, but was 5% higher than this week last year. With the exception of the Rockies, power burn fell this week in all regions, and the greatest declines occurred in the Midcontinent and Midwest. Although power burn declined this week, for the month of January, power burn is on track to be at record levels. Exports to Mexico were also down for the week, falling 7%."